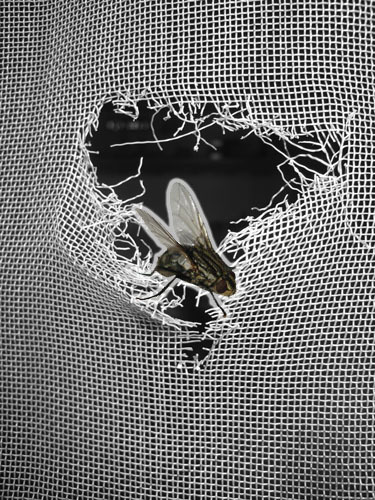 Is your damaged window or door screen bugging you? Cleaner Windows understands just how frustrating it is to have holes in your window or door screens giving flies and mosquito’s a short cut in to your home or business. Have you tried to fix your screen and found later that same day the screen has jumped out from the spline? This is not your fault, many of the DIY stores do not have the correct spline sizes making it hard to repair yourself. Our mobile on-site screen repair service can fix your screens at your home or business. Cleaner Windows can re-screen your existing windows and doors with special fiberglass screen fabrics, making them look like new. If you need new screens manufacturing we can help. If you have pets that have done damage then consider our pet resistant screens these are 10 times stronger than traditional screen fabric. Simply call us today on 905 9660838 to schedule a screen repair visit. If you are looking for screen building see further down. Pet screen available at extra cost. Please Note : Our onsite screen repair has a minimum fee of $90, waive if tied in with any of our other services. We install the best retractable screens on the market. With our revolutionary patented “speed reducer” no tiny fingers get crushed when retracting and our heat sealed top and bottom mesh helps prevent fraying. Call today to see a demonstration. We can make you new or replacement window screens using the following colors of 5/16 screen frame. You decide if you want plastic corners or mitered, on your new screens. Our Screen Repair and Screen Making Service covers the following areas of Ontario. We make screens at your location in Burlington, Oakville, Waterdown, Milton, Aldershot, Ancaster, Stoney Creek, Carlisle, Kilbride, Hamilton and Dundas.